The last part of my resolution is to get our apartment into tip-top shape! I'm a slow-and-steady purchaser, waiting...thinking...comparing....thinking...mulling...saving....waiting....until I'm finally ready to take the plunge. We got an early start on the resolution yesterday by going on a mini spree, and purchasing the table and chairs above. I just love their slightly Scandinavian and industrial feel. We haven't had a table to eat on for over a year and a half since our apartment couldn't fit one, so it's a real treat to have something that we not only like but that was a great price as well. I've got a DIY upholstered headboard in the works, and lots of fuzzy flokati rugs floating around the house already. Now it's just playing the waiting game while I slowly assemble the rest of the place. Woohoo! 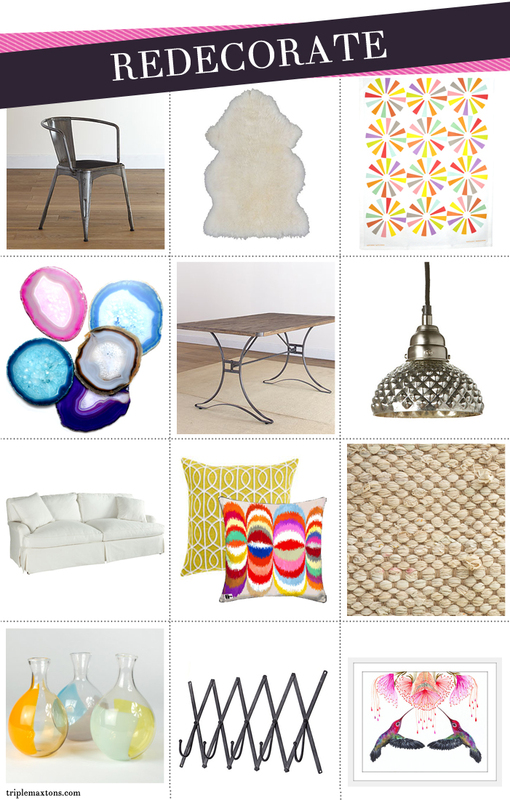 I love the agate trivets and I bought that World Market table for a client last month! I put benches on the sides and Windsor style chairs at either end. Yep, that's basically how it is around here. I've wasted so much money in the past on home accessories that now I don't spend until I have the full vision for the room in my mind, and the item in question definitely fits that vision. i recently bought the jackson table for my new office and i LOVE it! it is an awesome size for a larger desk area. That's the way to do it, Jessica! I have made so many mistakes in the past on impulse buys. It's hard to resist some times, but in the end, it's worth it! Oooh I am going to really love this look! Can't wait to see the big reveal! I shop exactly the same way! Especially when it comes to home. Aughhhh. I've just added you to my blogroll on http://damisabina.wordpress.com. Maybe you'd like to check it out!